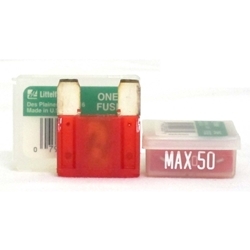 Littelfuse Maxi 50 50amp Blade Fuses Single Pack. MAXI Fuses are primarily used for under hood applications and are produced with a high temperature polymer and silver plated blades. They replace the commonly used fusible wire or fusible link to protect a high current segment or system of the wiring harness. Features Littelfuse designed industry standard color coding to indicate amp rating.